For a day, a weekend, or an entire season, Grand Lake is the perfect place for a getaway. And whether you want to be steps from the lakeshore or near the casino action, you have plenty of options for your home away from home. With this Grand Lake, OK lodging guide, you can take tours and make reservations online. Find the Grand Lake hotel, resort or cabin for your dream vacation now. Dream Catcher Resorts offers stunning properties that sits on the shores of Grand Lake and provides guests with the exquisite views of the water and its quixotic sunsets. Step into a relaxing lodge style room that is relaxing, comfortable and minutes away from putting your boat into Grand Lake or yelling out “jackpot” at Grand Lake Casino. Come by Land or by Grand to dine at the iconic Mooney's Sunset Bar & Grill. We offer delicious cocktails, live entertainment and a tasty menu with classic recipes. 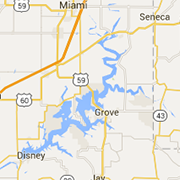 Located on the shores of Grand Lake O'Cherokees in Grove Oklahoma. The 38 acre park offers camping, fishing and much more!